Download "Technical Manual No. 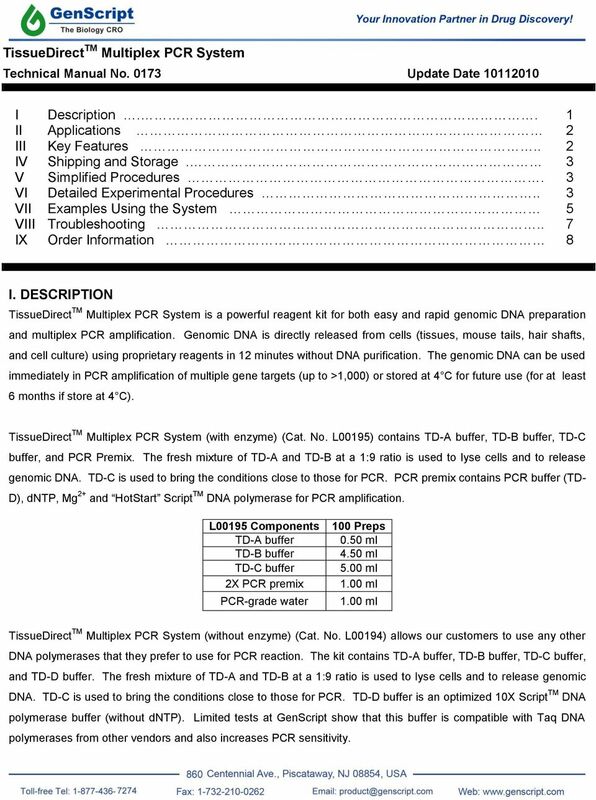 0173 Update Date 10112010"
1 TissueDirect TM Multiplex PCR System Technical Manual No Update Date I Description.. 1 II Applications 2 III Key Features.. 2 IV Shipping and Storage. 3 V Simplified Procedures. 3 VI Detailed Experimental Procedures.. 3 VII Examples Using the System 5 VIII Troubleshooting.. 7 IX Order Information 8 I. DESCRIPTION TissueDirect TM Multiplex PCR System is a powerful reagent kit for both easy and rapid genomic DNA preparation and multiplex PCR amplification. Genomic DNA is directly released from cells (tissues, mouse tails, hair shafts, and cell culture) using proprietary reagents in 12 minutes without DNA purification. The genomic DNA can be used immediately in PCR amplification of multiple gene targets (up to >1,000) or stored at 4 C for future use (for at least 6 months if store at 4 C ). TissueDirect TM Multiplex PCR System (with enzyme) (Cat. No. 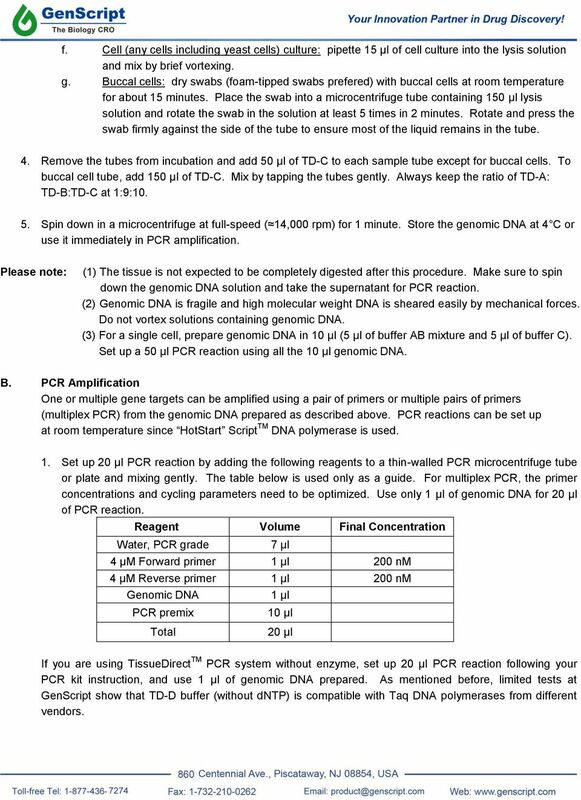 L00195) contains TD-A buffer, TD-B buffer, TD-C buffer, and PCR Premix. The fresh mixture of TD-A and TD-B at a 1:9 ratio is used to lyse cells and to release genomic DNA. TD-C is used to bring the conditions close to those for PCR. PCR premix contains PCR buffer (TD- D), dntp, Mg 2+ and HotStart Script TM DNA polymerase for PCR amplification. L00195 Components TD-A buffer TD-B buffer TD-C buffer 2X PCR premix PCR-grade water 100 Preps 0.50 ml 4.50 ml 5.00 ml 1.00 ml 1.00 ml TissueDirect TM Multiplex PCR System (without enzyme) (Cat. No. L00194) allows our customers to use any other DNA polymerases that they prefer to use for PCR reaction. The kit contains TD-A buffer, TD-B buffer, TD-C buffer, and TD-D buffer. The fresh mixture of TD-A and TD-B at a 1:9 ratio is used to lyse cells and to release genomic DNA. TD-C is used to bring the conditions close to those for PCR. TD-D buffer is an optimized 10X Script TM DNA polymerase buffer (without dntp). Limited tests at GenScript show that this buffer is compatible with Taq DNA polymerases from other vendors and also increases PCR sensitivity. 2 II. APPLICATIONS ozl00194 Components TD-A buffer TD-B buffer TD-C buffer TD-D buffer PCR-grade water 100 Preps 0.50 ml 4.50 ml 5.00 ml 0.20 ml 1.00 ml For genomic DNA extraction from: Tissues (fresh, frozen or paraffin), tissue microdissection Animal (such as mouse) tails Yeast cells Buccal cells Cell culture Hair shaft Saliva Sperm For blood, please use BloodReady TM Multiplex PCR System. And for application such as: SNP genotyping and mutation detection Target detection in transgenic mice DNA sequencing and cloning Quantitative PCR III. KEY FEATURES Easy to perform: very simple and rapid procedure to extract genomic DNA in 12 min. High specificity: highly specific amplification of genomic DNA using HotStart Script TM DNA polymerase (a GenScript proprietary DNA polymerase). Super sensitivity: genomic DNA from a single sperm has been successfully used in multiplex PCR amplification of more than 1000 amplicons and subsequent DNA genotyping assays. The super sensitivity of this kit will dramatically cut down the tissue usage to save your precious tissue samples. This kit will also allow you to use less invasive method for genomic DNA preparation needed for genotyping. 3 IV. SHIPPING AND STORAGE This kit is shipped on blue ice. Store the kit at -20 C. V. SIMPLIFIED PROCEDURES 1. Thaw buffer TD-A, TD-B and TD-C at room temperatureand vortex the solutions. After thawing, keep TD-A buffer on ice, TD-B and TD-C can be kept on ice or at room temperature. Mix 5 μl TD-A and 45 μl TD-B (A to B ratio is 1:9) in a microcentrifuge tube to make the lysis solution. Add the lysis solution to tissue samples. 2. Mix and incubate the samples at 65 C for 10 min. 3. Remove the tubes from incubation and add 50 μl of TD-C to each sample tube. Mix by tapping the tubes gently. 4. Spin down in a microcentrifuge at full-speed ( 14,000 rpm) for 1 minute. 5. Set-up and perform PCR reaction in a PCR cycler. 6. Analyze PCR reactions by agarose gel electrophoresis. VI. 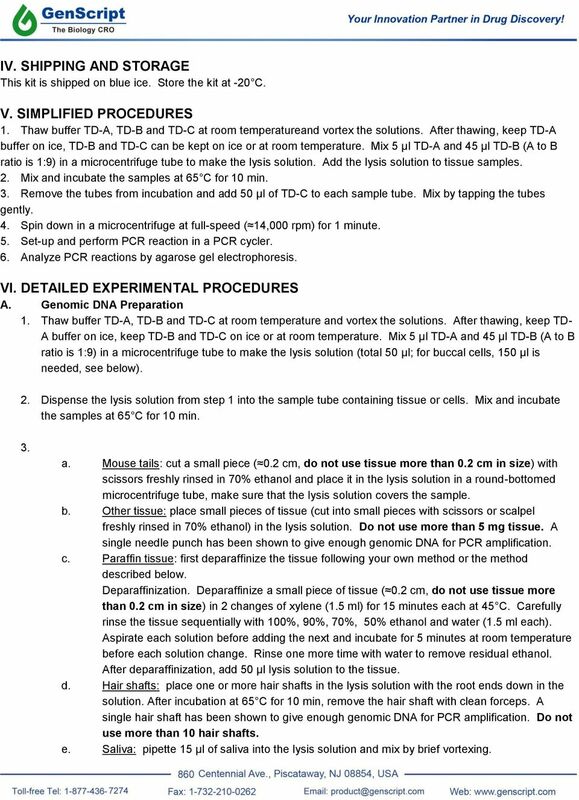 DETAILED EXPERIMENTAL PROCEDURES A. Genomic DNA Preparation 1. Thaw buffer TD-A, TD-B and TD-C at room temperature and vortex the solutions. After thawing, keep TD- A buffer on ice, keep TD-B and TD-C on ice or at room temperature. Mix 5 μl TD-A and 45 μl TD-B (A to B ratio is 1:9) in a microcentrifuge tube to make the lysis solution (total 50 μl; for buccal cells, 150 μl is needed, see below). 2. Dispense the lysis solution from step 1 into the sample tube containing tissue or cells. Mix and incubate the samples at 65 C for 10 min. 3. a. Mouse tails: cut a small piece ( 0.2 cm, do not use tissue more than 0.2 cm in size) with scissors freshly rinsed in 70% ethanol and place it in the lysis solution in a round-bottomed microcentrifuge tube, make sure that the lysis solution covers the sample. b. Other tissue: place small pieces of tissue (cut into small pieces with scissors or scalpel freshly rinsed in 70% ethanol) in the lysis solution. Do not use more than 5 mg tissue. A single needle punch has been shown to give enough genomic DNA for PCR amplification. c. Paraffin tissue: first deparaffinize the tissue following your own method or the method described below. Deparaffinization. Deparaffinize a small piece of tissue ( 0.2 cm, do not use tissue more than 0.2 cm in size) in 2 changes of xylene (1.5 ml) for 15 minutes each at 45 C. Carefully rinse the tissue sequentially with 100%, 90%, 70%, 50% ethanol and water (1.5 ml each). Aspirate each solution before adding the next and incubate for 5 minutes at room temperature before each solution change. Rinse one more time with water to remove residual ethanol. After deparaffinization, add 50 μl lysis solution to the tissue. d. Hair shafts: place one or more hair shafts in the lysis solution with the root ends down in the solution. After incubation at 65 C for 10 min, remove the hair shaft with clean forceps. A single hair shaft has been shown to give enough genomic DNA for PCR amplification. Do not use more than 10 hair shafts. e. Saliva: pipette 15 μl of saliva into the lysis solution and mix by brief vortexing. 4 f. Cell (any cells including yeast cells) culture: pipette 15 μl of cell culture into the lysis solution and mix by brief vortexing. g. Buccal cells: dry swabs (foam-tipped swabs prefered) with buccal cells at room temperature for about 15 minutes. Place the swab into a microcentrifuge tube containing 150 μl lysis solution and rotate the swab in the solution at least 5 times in 2 minutes. Rotate and press the swab firmly against the side of the tube to ensure most of the liquid remains in the tube. 4. Remove the tubes from incubation and add 50 μl of TD-C to each sample tube except for buccal cells. To buccal cell tube, add 150 μl of TD-C. Mix by tapping the tubes gently. Always keep the ratio of TD-A: TD-B:TD-C at 1:9: Spin down in a microcentrifuge at full-speed ( 14,000 rpm) for 1 minute. Store the genomic DNA at 4 C or use it immediately in PCR amplification. Please note: (1) The tissue is not expected to be completely digested after this procedure. Make sure to spin down the genomic DNA solution and take the supernatant for PCR reaction. (2) Genomic DNA is fragile and high molecular weight DNA is sheared easily by mechanical forces. Do not vortex solutions containing genomic DNA. (3) For a single cell, prepare genomic DNA in 10 μl (5 μl of buffer AB mixture and 5 μl of buffer C). Set up a 50 μl PCR reaction using all the 10 μl genomic DNA. B. PCR Amplification One or multiple gene targets can be amplified using a pair of primers or multiple pairs of primers (multiplex PCR) from the genomic DNA prepared as described above. PCR reactions can be set up at room temperature since HotStart Script TM DNA polymerase is used. 1. Set up 20 μl PCR reaction by adding the following reagents to a thin-walled PCR microcentrifuge tube or plate and mixing gently. The table below is used only as a guide. For multiplex PCR, the primer concentrations and cycling parameters need to be optimized. Use only 1 μl of genomic DNA for 20 μl of PCR reaction. Reagent Volume Final Concentration Water, PCR grade 7 μl 4 µm Forward primer 1 μl 200 nm 4 µm Reverse primer 1 μl 200 nm Genomic DNA PCR premix Total 1 μl 10 μl 20 μl If you are using TissueDirect TM PCR system without enzyme, set up 20 μl PCR reaction following your PCR kit instruction, and use 1 μl of genomic DNA prepared. As mentioned before, limited tests at GenScript show that TD-D buffer (without dntp) is compatible with Taq DNA polymerases from different vendors. 5 2. The commonly used thermal profiles can be used for PCR amplification. The following two thermal profiles are recommended for the amplification of a single amplicon and multiple amplicons, respectively. a. Thermal profiles for amplification of a single amplicon with the primer concentration of 200 nm for each primer. Activation of Taq DNA polymerase: 94 C for 15 min 40 PCR cycles: Denaturation: 94 C for 40 sec Annealing: C for 1 min Extension: 72 C for 30 sec to 2 min ( 1 kb/min) Final extension: 72 C for 3 min. b. Thermal profiles for amplification of multiple amplicons with the each primer at concentration of 50 nm. Activation of Taq DNA polymerase: 94 C for 15 min. 40 PCR cycles: Denaturation: 94 C for 40 sec Annealing: C for 2 min Extension: ramping from 55 C to 72 C for 5 min Final extension: 72 C for 3 min. VII. EXAMPLES USING THE SYSTEM A. Mouse Tail Genomic DNA Preparation and PCR Amplification. 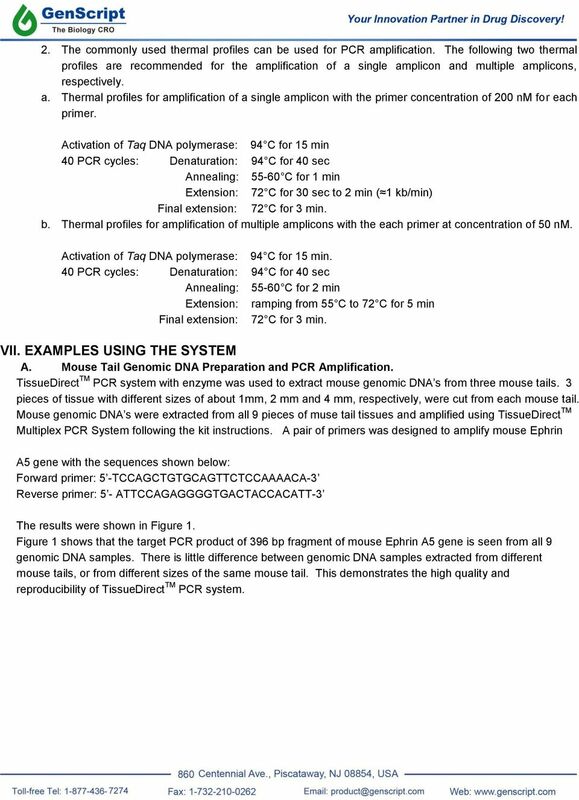 TissueDirect TM PCR system with enzyme was used to extract mouse genomic DNA s from three mouse tails. 3 pieces of tissue with different sizes of about 1mm, 2 mm and 4 mm, respectively, were cut from each mouse tail. Mouse genomic DNA s were extracted from all 9 pieces of muse tail tissues and amplified using TissueDirect TM Multiplex PCR System following the kit instructions. A pair of primers was designed to amplify mouse Ephrin A5 gene with the sequences shown below: Forward primer: 5 -TCCAGCTGTGCAGTTCTCCAAAACA-3 Reverse primer: 5 - ATTCCAGAGGGGTGACTACCACATT-3 The results were shown in Figure 1. Figure 1 shows that the target PCR product of 396 bp fragment of mouse Ephrin A5 gene is seen from all 9 genomic DNA samples. There is little difference between genomic DNA samples extracted from different mouse tails, or from different sizes of the same mouse tail. This demonstrates the high quality and reproducibility of TissueDirect TM PCR system. 6 Figure 1. 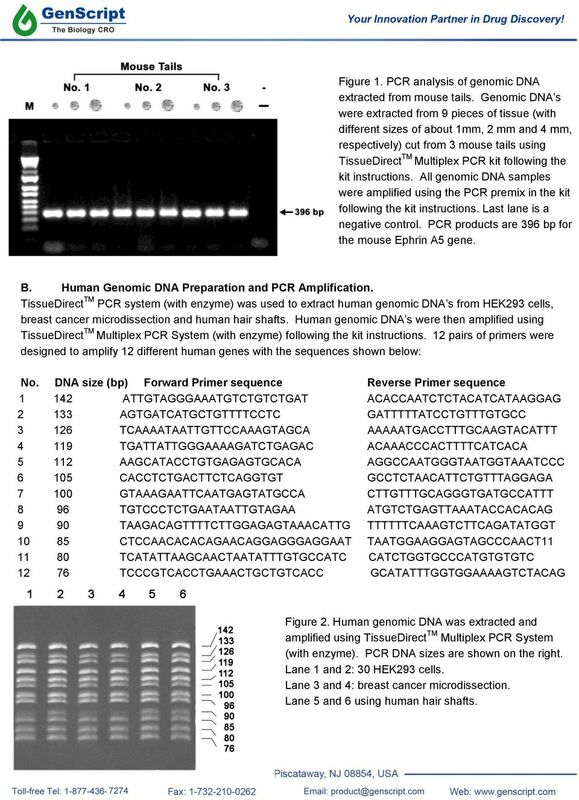 PCR analysis of genomic DNA extracted from mouse tails. Genomic DNA s were extracted from 9 pieces of tissue (with different sizes of about 1mm, 2 mm and 4 mm, respectively) cut from 3 mouse tails using TissueDirect TM Multiplex PCR kit following the kit instructions. All genomic DNA samples were amplified using the PCR premix in the kit following the kit instructions. Last lane is a negative control. PCR products are 396 bp for the mouse Ephrin A5 gene. B. Human Genomic DNA Preparation and PCR Amplification. TissueDirect TM PCR system (with enzyme) was used to extract human genomic DNA s from HEK293 cells, breast cancer microdissection and human hair shafts. Human genomic DNA s were then amplified using TissueDirect TM Multiplex PCR System (with enzyme) following the kit instructions. 12 pairs of primers were designed to amplify 12 different human genes with the sequences shown below: No. DNA size (bp) Forward Primer sequence Reverse Primer sequence ATTGTAGGGAAATGTCTGTCTGAT ACACCAATCTCTACATCATAAGGAG AGTGATCATGCTGTTTTCCTC GATTTTTATCCTGTTTGTGCC TCAAAATAATTGTTCCAAAGTAGCA AAAAATGACCTTTGCAAGTACATTT TGATTATTGGGAAAAGATCTGAGAC ACAAACCCACTTTTCATCACA AAGCATACCTGTGAGAGTGCACA AGGCCAATGGGTAATGGTAAATCCC CACCTCTGACTTCTCAGGTGT GCCTCTAACATTCTGTTTAGGAGA GTAAAGAATTCAATGAGTATGCCA CTTGTTTGCAGGGTGATGCCATTT 8 96 TGTCCCTCTGAATAATTGTAGAA ATGTCTGAGTTAAATACCACACAG 9 90 TAAGACAGTTTTCTTGGAGAGTAAACATTG TTTTTTCAAAGTCTTCAGATATGGT CTCCAACACACAGAACAGGAGGGAGGAAT TAATGGAAGGAGTAGCCCAACT TCATATTAAGCAACTAATATTTGTGCCATC CATCTGGTGCCCATGTGTGTC TCCCGTCACCTGAAACTGCTGTCACC GCATATTTGGTGGAAAAGTCTACAG Figure 2. Human genomic DNA was extracted and amplified using TissueDirect TM Multiplex PCR System (with enzyme). PCR DNA sizes are shown on the right. Lane 1 and 2: 30 HEK293 cells. Lane 3 and 4: breast cancer microdissection. Lane 5 and 6 using human hair shafts. 7 VIII. TROUBLESHOOTING The table below is guideline for troubleshooting. Problem Probable Cause Solution No PCR DNA Non-specific DNA products High background (with your own Taq polymerase) PCR may be inhibited by components in the tissue. One or more PCR components may be missing. PCR conditions are not optimized. The annealing temperature may be too high; More cycles may be needed; The denaturation time may be too short; The extension time may be too short. The primers may not be designed optimally. Target template is highly GCrich. Genomic DNA is lost especially when a single cell is used. The primers may not be designed optimally. Annealing temperature is too low. Too much Taq DNA polymerase may be used. Dilute the genomic DNA 10 fold with a mixture of TD-A, TD-B and TD-C at the ratio of 1:9:10. Always run a positive control side by side with PCR using genomic DNA prepared using the kit. Optimize the PCR conditions by decreasing annealing temperature in 2-4 C increments, or increasing the number of cycles, or increasing the denaturation time in 10 second increments, or increasing the extension time in 1minute increments. It is recommended to change one parameter each time. The primer designing is critical for high quality PCR. Longer primers of nucleotides with a GC content of 45-60% and with a more stable 5 -end than 3 -end usually make good primers. The target will be difficult to denature even with a longer denaturation step. Betaine, DMSO and formamide can help amplification of high GC-rich template. Do not use pippet tips to mix. Tap the centrifuge tubes gently to mix. Primers may form dimers, or prime at non-specific target sequences. Longer primers of nucleotides with a GC content of 45-60% and with a more stable 5 -end than 3 -end usually make good primers. Optimize the PCR conditions by increasing annealing temperature in 2-4 C increments, or decreasing the number of cycles. Optimize the PCR conditions by decreasing the amount of Taq DNA polymerase in 0.5 unit increments. False positive Reagents are contaminated. It is recommended that a negative control without using genomic DNA be run to make sure no contamination occurs. Intended Use: The kit is designed to detect the 5 different mutations found in Asian population using seven different primers. TaKaRa Ex Taq 1PCR PRODUCTS. High Performance PCR. Kit Components RR001A. Applications RR01AM. Description. Concentration. Form. Storage. 360 Master Mix. , and a supplementary 360 GC Enhancer. Overview. KAPAHiFi HotStart is the engineered KAPAHiFi DNA Polymerase with an antibody-based hot start technology and improved buffer system. FOR RESEARCH USE ONLY. NOT FOR HUMAN OR DIAGNOSTIC USE. Contents. Principle. New in this edition! New capped V-Spin column ensures the elimination of potential contamination during operation. ABSTRACT. Promega Corporation, Updated September 2008. http://www.promega.com/pubhub. 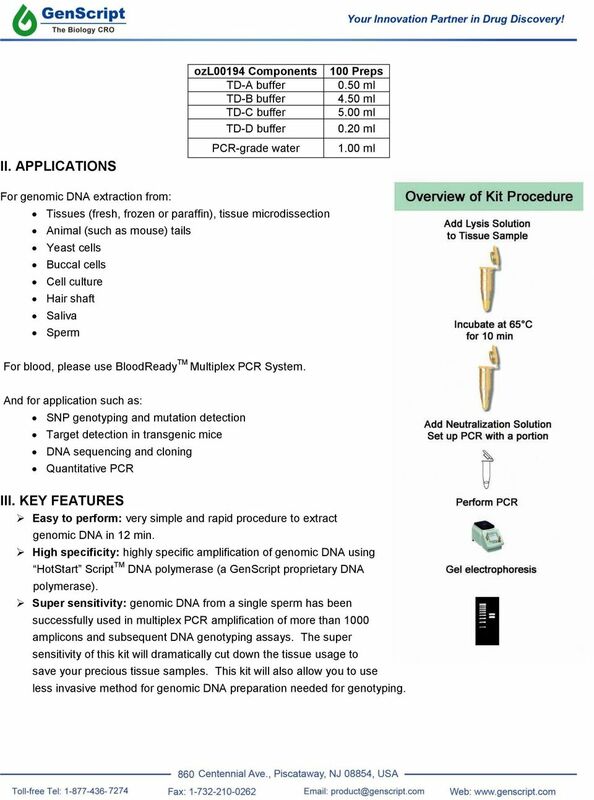 1 Campbell-Staton, S.
Instruction manual KOD -Plus- 0902 F0934K KOD -Plus- Contents  Introduction  Components  Quality testing  Primer design  Cloning of PCR products  Protocol 1. Standard reaction setup 2. QUANTITATIVE RT-PCR. A = B (1+e) n. A=amplified products, B=input templates, n=cycle number, and e=amplification efficiency. 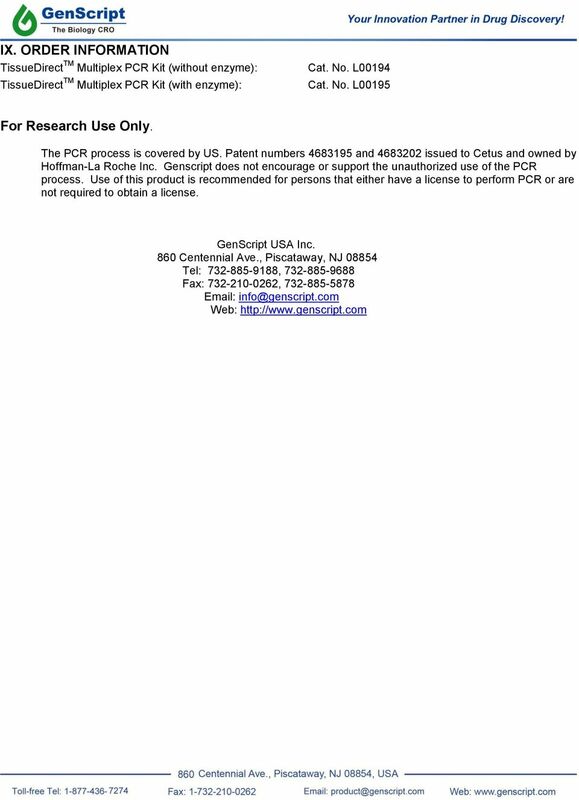 PR037 G-Biosciences 1-800-628-7730 1-314-991-6034 technical@gbiosciences.com A Geno Technology, Inc. (USA) brand name Polymerase Chain Reaction (PCR) Teacher s Guidebook (Cat. # BE 305) think proteins! 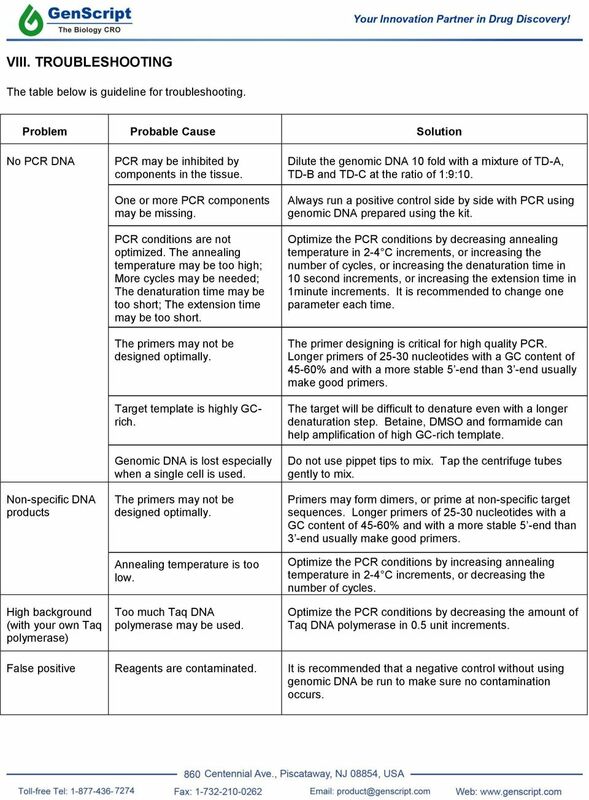 PCR Optimization: Reaction Conditions and Components The GeneAmp PCR process is widely employed in a tremendous variety of experimental applications to produce high yields of specific DNA target sequences.